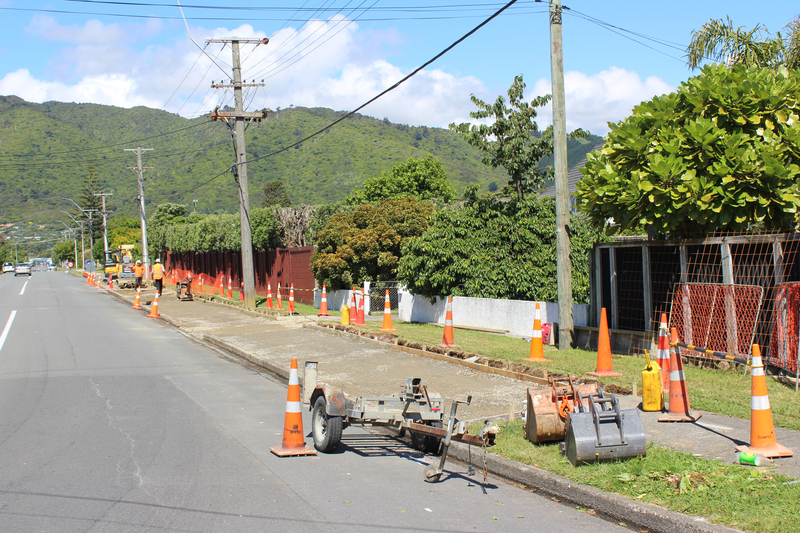 As is obvious from this photo taken this afternoon, the existing footpath and most of the grass berm, and the trees on it, are being removed along the south side of Ngaio Road — to be replaced with a wide strip of concrete. The objective it seems is to create a “shared path” for both pedestrians and cyclists. This council just cant stop spending borrowed money. An 800 metre long strip of concrete 2.5 metres wide = 2000 sq metres; that’s a lot of concrete. When we had about 80 sq metres of driveway concreted 12 years ago it cost $10,000 so 2,000 sq metres would have to cost $250,000 in 2006 terms; allowing for inflation.that would be over $320,000 now. I live in Ngaio Rd, and made a submission in opposition to this silly idea, but they were determined to go ahead with an unnecessary, dangerous “shared path” which I believe no one will use. Such disruption for no good reason……….I’m a cyclist, and can see no need for it, and told them so. AND residents paid for the trees which they put in several years ago, and they just came along and chopped them all down on the south side of the road. I’m NOT impressed!